Jungle Adventures: Super World is a super adventure by OneSoft Studio. The game is about Zog, a jungle boy want to become a treasure hunter. One day, Zog found an ancient map in the warehouse of his grandfather, it leads to the super jungle world. Your job is to help Zog jump and run through the super jungle world, pass so much monsters on the way and find treasure at the end. 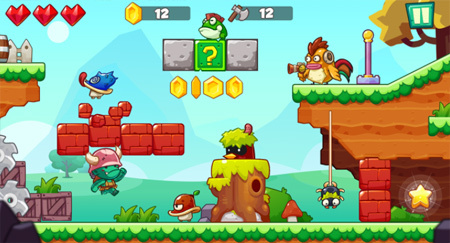 The game features over 80 levels, 30 monsters, and 5 epic Bosses. If you get stuck in the game, check out the video walkthrough and gameplay for the game. This entry was posted in Android Games, iOS Games, Mobile Games, Walkthrough and tagged Jungle Adventures: Super World Cheats, Jungle Adventures: Super World Flipy Bush, Jungle Adventures: Super World Gameplay, Jungle Adventures: Super World Guide, Jungle Adventures: Super World Hints, Jungle Adventures: Super World Review, Jungle Adventures: Super World Solutions, Jungle Adventures: Super World Strategy, Jungle Adventures: Super World Tips, Jungle Adventures: Super World Walkthrough by Marvin. Bookmark the permalink.